On tackling the complexities of socioeconomic inequality through this beautiful story of a simple peasant. 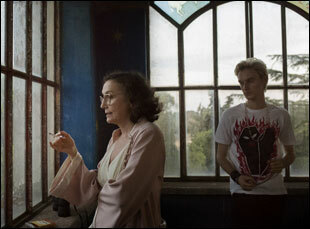 No matter how dire the circumstances may be, there’s always been the suggestion in Alice Rohrwacher’s work that there’s a little bit of magic in the air, a feeling that pervades her latest “Happy as Lazzaro” and crystalizes in the present day when her lead character (Adriano Tardiolo) can be seen walking around a rooftop with Ultimo (Sergi López), who’s scraped by on small cons while making a home for himself on the streets of the big city. Lazzaro has just arrived from the country where he’s toiled for years as a farmhand, and used to foraging for various greens to eat, he can parse the edibles from the weeds that grow fresh from the cracks of the asphalt leading Ultimo to wonder why he’s shelled out money for years when he’s been sitting on a such a bounty. This discovery is greeted with delight by Ultimo, but you’ll undoubtedly find a grin creep across your face as well, in spite of knowing the desperation that leads to such happiness over the wild greens, since Lazzaro’s ability to find sustenance under the pavement seems to be echoed by Rohrwacher’s own skill to get at something so rich and pure when the industrialization of filmmaking has often robbed cinema of such moments of direct emotion and in telling the story of people who are only seen by some as capital, “Happy as Lazzaro” is enormously affecting in how compassionate and sensitive it is to the human condition. 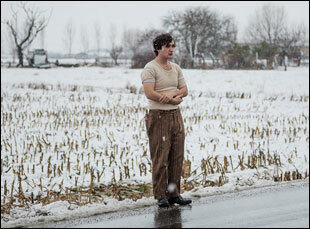 For a drama that summons the memory of the greatest neorealist classics from the director’s native Italy while feeling utterly contemporary in its global consciousness and hints of magical realism, “Happy as Lazzaro” is naturally tricky to place in time, first finding Lazzaro staring off in the distance as a friend prepares to prepares to ask for a local woman’s hand in marriage by serenading her from below her window with a full band in tow. The courtship seems right out of the 17th century, but a walkman soon makes an appearance in the village of Inviolata when the Marquis (Nicoletta Braschi) who owns the land returns with her spoiled child Tancredi (Luca Chikovani), who listens to techno to imagine he’s back in the city, to check on how her tobacco crops are doing. They don’t know what to make of Lazzaro, who doesn’t question any requests they make as one of their indentured servants, regardless of how outlandish they may seem, and although some in the village, such as the young couple who plan to get married, believe there’s a world beyond the mountains that surround Inviolata, Lazzaro is content with his surroundings, not knowing any better. Ignorance may be bliss for Lazzaro, but Rohrwacher is shrewd in observing that as much as times have changed, they have largely stayed the same or gotten worse when it comes to upward social mobility, employing Lazzaro (played with pitch-perfect tender-hearted naivete by Tardiolo, an economics major the director plucked out of college to play her lead) as a way to connect the past and the present when he eventually ventures out of Inviolata to experience the city. Just as she started production on “Happy as Lazzaro” by actually planting the tobacco crops you see in the film so they’d grow to the right height for filming, so much of what Rohrwacher seeds narratively ripens before your eyes to feel both fresh and inevitable, keenly aware of human nature and its occasional idiosyncrasies. What may not be surprising is just how Rohrwacher approaches her work, building layers upon layers for her films such as “Corpo Celeste” and “The Wonders” with all the cinematic tools at her disposal to feel as sumptuous as they do. On the eve of the film’s premiere on Netflix following a much-celebrated debut at Cannes where the filmmaker won the award for Best Screenplay, Rohrwacher spoke through a translator about the impetus for “Lazzaro,” discovering her unforgettable lead actor and how she envisioned the film as a two-way mirror. Every story is made out of different levels and it’s a little bit like a plant. You need a seed, but then you need the right weather conditions, you need the right everything in order for the plant to grow up. That’s what happened to me. When I was a year old, sharecropping became illegal in Italy, and my parents decided to go and live in one of the homes that ended up being abandoned by the sharecroppers. Therefore, I was fascinated by all of this and I grew up collecting tales about the end of sharecropping. I was interested in the shapes of these rooms [in the house] and all of the objects that were in there and that had been abandoned. I even met some farmers some times and they would talk to me and say, “Oh, you went to live in there?” To them, it was unfathomable because they wanted to move away from what was something bad, something ugly for them. And I couldn’t understand why. Then I realized that they had been subjected to an invisible exploitation, not like the Marquis in the movie [exactly] — she did not imprison the farmers, but she put them in such a condition that they were not able to wish or desire anything different from what they had. This [film] is also connected to the fact that I read a newspaper article when I was pretty young that told that there was a Marquis that had kept some of her sharecroppers as sharecroppers without informing them, taking advantage of how naive they were. So when I finally was offered the opportunity to be in the program of the New York Film Festival Filmmaker-in-Residence, I had the distance that allowed me to look at all of that and write about it. I understand the character of Lazzaro wasn’t immediately in the story, but was the idea of connecting the past to the present always there even without him? Yes, connecting past and present was there from the beginning. I decided to tell this story exactly when I saw that I was connecting the past and the present [myself] and that allowed me to tell the story. Usually we see the journey of the hero as the hero that goes through this, that and the other and he changes, but instead, I wanted to tell the story of something that was unchanged, something that in the end turned out to be innocent. 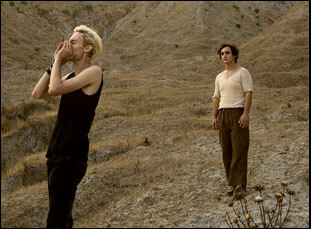 What convinced you that Adriano was the right person to play Lazzaro? How did you develop the style of camerawork for the film with your cinematographer Helene Louvart? We tried to tell the story on different layers, so we separated all the scenes into three [different] natures. The first of these natures was a scene that was only meant to narrate [or tell the story] and there was no other reason for it to be, and then [another] level would be added to it and it was the gaze on Lazzaro, a time in which we felt that we needed to dilate space and time. We needed to show why we thought he was so special — because he was never trying to attract attention onto himself — and we needed to make it clear. And then there was a third level – [the idea that] nature is looking at him. I’m not religious, [but when I say that] I’m really thinking of something that would be God or Mother Nature that is looking at him. You also do such fascinating things with sound. There’s one specific moment where Nicola, the go-between for the Marquis and the villagers in Inviolata, is leaving the farm and you can hear a radio frequency, which is not something you’d necessarily hear in that environment, but feels emotionally true. How attached are you to what’s organic in a situation versus what feels right? Yes, we wanted to create some sort of bubble in that scene and we wanted to show Nicola’s fear, the fact that he is so close to the outside world and the wind that you can hear is not the regular wind you would hear outdoors, but the wind that is inside the home, from which he looks at the other people and is closed to them. And we wanted to have to have a sound that could actually give the idea of many other sounds. It could refer to the wolf [that appears throughout the film], but also many other things. We enjoyed working with the sound, the same way that we worked with images and that we worked with actors. In that particular case, the sound has the task of adding another layer. Think, for instance, of the way the movie begins in the dark. It’s the sound that leads you further. “Happy as Lazzaro” is now streaming on Netflix here and opens in Los Angeles on November 30th at the Regent Theater. Interview: Florian Henckel von Donnersmarck on Approaching His Biggest Canvas Yet for "Never Look Away"
Interview: Paige Goldberg Tolmach on Facing Her Fears as a Filmmaker with "What Haunts Us"